The deep winter of Steamboat can leave a bicycle fanatic longing for warm days, dry dirt and short sleeves. These dark short days are balanced with even darker longer winter nights. This gives one a ton of time to contemplate a new build. 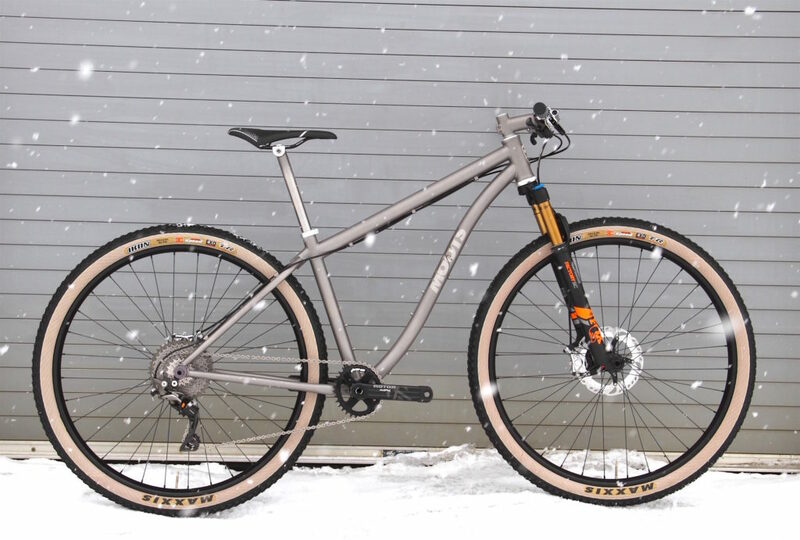 The build featured here belongs to our finish department lead, Brett Champlain. Brett spent some time dreaming up this amazing MX RSL build that features quality parts that will require little maintenace and add tons of enjoyment……that is, when the snow recedes or he makes a trip to the desert. I’m guessing he’ll be in Fruita/Grand Junction well before we see trail around here. I mean, really, you can’t let a rig like this just site around right? 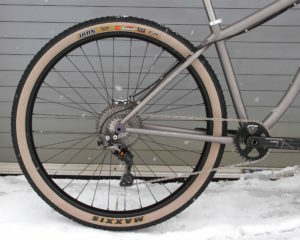 Brett went with DT SWISS 240 hubs front and rear for bomb-proof performance and longevity. 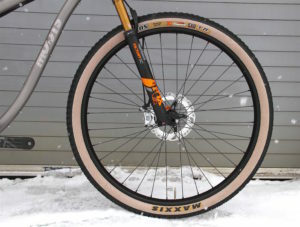 Matted to a set of de-badged WTB ASYM rims with a nice 29mm inner width and wrapped in Maxxis IKON’s in a 2.20 Brett is fond of hand built wheels and does his own work…he likes to know what he’s riding. At the center of the pics above is the Rotor KAPIC crank spinning a 32t Qring. 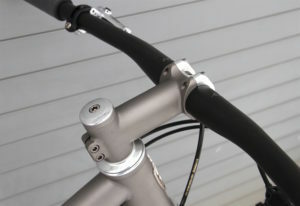 Fox 100mm Step Cast fork provides suspension and keeps it light and stout. Out back a mechanical XTR rear der paried to an XTR shiter handles the gear selection duties. Up front Brett went with a Moots stem with no logo, paired to a Ritchey WCS carbon flat bar. 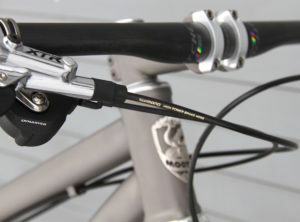 XTR brake levers run the XTR calipers on 160mm rotors front & rear. 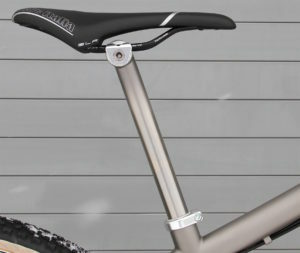 Chris King leads the way with head set duties and is silver matched to the face plate of the stem, seat collar and seat post side plates. 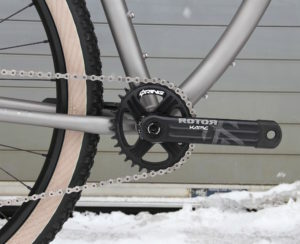 The MX RSL is built for a 30.9 post, however Brett added his own touch by using a shim to bring it to 27.2mm to provide just a bit of forgiveness in the saddle. Brett is also on the light side and does not need the stout 30.9 post. 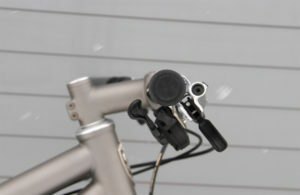 This is a nice way to really tune in the bike to your specific style and needs. 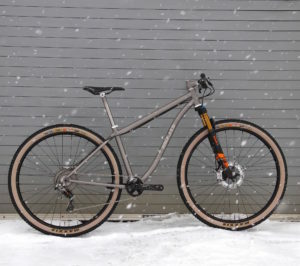 A snowy, dreamy day in Steamboat……dreaming of single track.